Gold seems to be falling out of favor with investors amid a looming rise in return on US debt as the US Federal Reserve is expected to announce an increase in its federal funds rate; however, the Head of Commodity Research at Germany's Commerzbank has advised investors to hold on to the precious metal rather than sell it. Gold seems to have fallen out of favor with investors as US Federal Reserve Chair Janet Yellen is expected to raise rates at its next policy meeting in September on the back of an improving American economy, boosting the dollar. Gold's Everlasting Shine: Is Fall in Gold Price a Sign of Inevitable Doom? 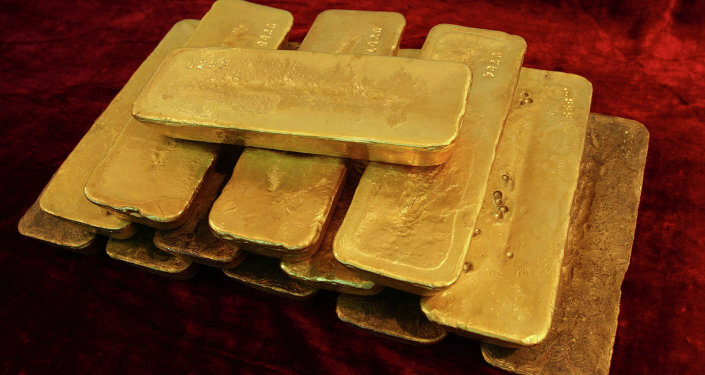 However, Eugen Weinberg, Head of Commodity Research at German Commerzbank suggests holding on the precious metal rather than selling it, as in the long term the price of gold is going to rise. In his interview with the German business magazine WirtschaftsWoche Heute, he explained that the gold has already hit a low and the expected announcement will not change much. “Fear of the turnaround in interest rates has already pushed the price. If the Fed does what everyone expects, then that has no more effect on the gold price,” he said. However, he suggested that if the Fed holds off on raising interest rates, the price of gold will immediately go up. The analyst also suggested that the beginning of a tightening rate cycle is usually the lowest point for the gold price. Weinberg also noted that the mood of investors, in fact, has proved as a good counter-indicator. They are wary of buying the metal due to the projected negative short-term trend, but he is rather optimistic about the long-term forecasts. However, he says a sustained increase in the price of bullion will be conditioned by the demand of Exchange-Traded Funds (ETF). The current sell-off of gold is “exaggerated”, the analyst says. He's also suggested that euro-based investors should hold onto gold rather than selling it. “Gold promises more stability than the paper currency Euro. Thanks to the loose monetary policy of the European Central Bank, the euro is likely to mutate into a weak currency. This suggests [one should] hold gold instead of selling it. In the long term, the price of gold, calculated in euros, will rise,” he said. He also noted that the central banks of the western countries have practically not been buying gold, while China, Russia, India and Turkey have been buying hundreds of tons each year, and see it as at an important means of diversifying their assets.